The Ministry of Gender and Family works for the protection and promotion of the rights of vulnerable groups in the Maldives. The Ministry’s main responsibilities include; Women’s Rights & Empowerment, Gender Equality, Child Rights & Family Well-being, Elderly Rights & Well-being, Disability Rights and Well-being and Social Protection Services. The Ministry works to promote women’s rights and improve the status and wellbeing of women in Maldives. The focus areas include women’s empowerment in social, economic & public life and protection from domestic violence. The Ministry also works to promote gender equality and remove all forms of discrimination. The Ministry works to promote and protect the rights of the child and family well-being in the Maldives, with a special focus on prevention of violence against children and promotion of child participation. The Ministry also works with relevant stakeholders to establish Community Social Groups (CSGs) at the island level, to identify and assist vulnerable children and families. Ahan Campaign was launched by the Ministry of Gender and Family in May 2015 as a nation-wide awareness campaign to end violence against children. The Campaign aims to empower children against abuse, raise public awareness, encourage reporting and provide support to victims of child abuse. Through Ahan Campaign, the Ministry conducts awareness sessions for students and parents and workshops for teachers. Details of achievements made in outreach and towards child abuse prevention through the Ahan Campaign is available on the Ahan Report 2015 – 2018. The Ministry works to protect and promote the rights and wellbeing of senior citizens in the Maldives, with a special focus on care and protection, independence and participation, health and wellbeing and preparation for retirement. Ministry of Gender and Family launched the ‘Ranveyla Campaign’ in August 2016 as a nation-wide awareness campaign to protect and promote the rights and wellbeing of senior citizens in the Maldives. The Campaign aims increase participation of elderly persons within family and community, enhance care and support provided for them, and improve their health and emotional well-being. Through Ranveyla Campaign, the Ministry seeks to improve services provided to senior citizens at community level by providing trainings to health and social service workers. The Ministry also conducts awareness sessions and health screenings for elderly population, and interactive sessions to bridge the intergenerational gap between youth and senior citizens. 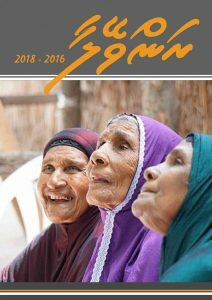 Details of achievements made in outreach and towards the protection and promotion of elderly rights through the Ranveyla Campaign is available on the Ranveyla Report 2016 – 2018. In 2015, the Government introduced a “Home-visit Program for Bedridden Persons” at ‘Dhamanaveshi’, to ensure that older bedridden persons are able to access adequate health care from their homes. This program focuses on providing basic health care services for bedridden patients above 65 years of age across the country. Registered bedridden elderly persons under the programme receive the benefit of home visits by medical professionals, and are provided with basic medical care and counselling if and when necessary. Since its establishment at the end of 2015, 93 persons have registered and received health services under this programme within greater Male’ region. The Ministry works to protect and promote the rights and wellbeing of children and persons with disabilities in the Maldives, with a special focus on early detection and intervention, equality and non-discrimination, inclusive education, training and employment. An allowance was introduced as a social protection benefit for persons with disabilities in the Maldives, under the ‘Protection of the Rights and Provision of Financial Assistance to Persons with Disabilities Act’ (Law No. 8/2010). Copy of the National Identity Card of the parent/guardian of the applicant. Bank Statement of the applicant or guardian. National Social Protection Agency (NSPA) makes arrangements for Persons with Disabilities to obtain assistive devices including wheelchairs, walkers, crutches and hearing aids. Persons with Disabilities who are eligible can submit the Request Form for Assistive Devices by the National Social Protection Agency (NSPA), with the following documentation. The quotation for the requested machine / device with brand and model number specified. National Social Protection Agency (NSPA) facilitates Psychological Assessments for Persons with Disabilities.